An Activity in Pega 7 can be used to process a HTML Rule and send the resulting content to a web browser. This is known in Pega as stream processing. This post shows how to create a Pega 7 activity to show HTML page that is accessible from a web browser with a URL. In the Pega 7 Designer Studio, click on +Create > Technical > HTML to create a new HTML Rule. Enter a label for the new HTML Rule, select the context, apply to class and ruleset version. Here, the name of the new rule is HelloWorldHTML. Then click on Create and open. On the HTML tab of the HTML Rule, select "HTML" in the Generate for drop down. Here, Browser Support is set to "All Supported Browsers" and Accessibility remains "No". Enter HTML code into the source text box, e.g. the above code shows a Hello World! message. Click on Save to save the changes to the HTML Rule. In the Pega 7 Designer Studio, click on +Create > Technical > Activity to create a new Activity Rule. 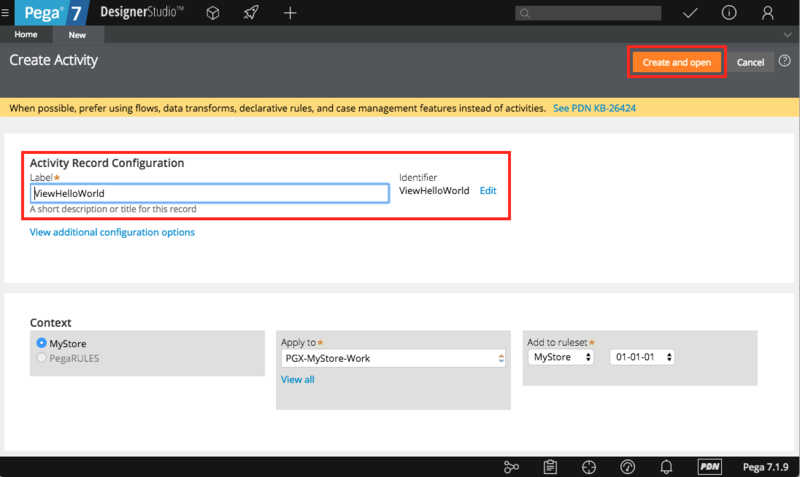 Enter a label for the new Activity Rule, select the context, apply to class and ruleset version. Here, the name of the new rule is ViewHelloWorld. Then click on Create and open. 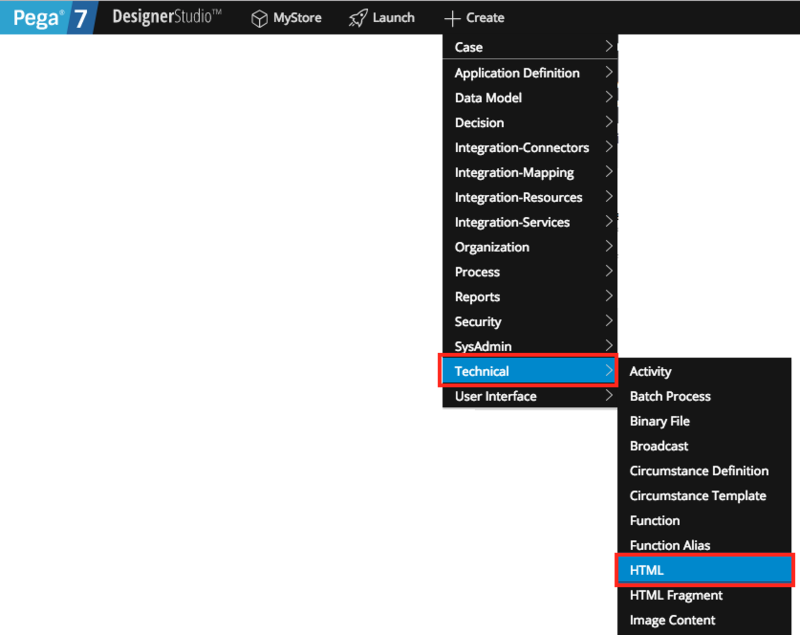 On the Pages & Classes tab of the Activity rule, add a reference to the class that contains the HTML Rule. Here, that class is PGX-MyStore-Work. On the Steps tab of the Activity rule, add two steps as shown below. 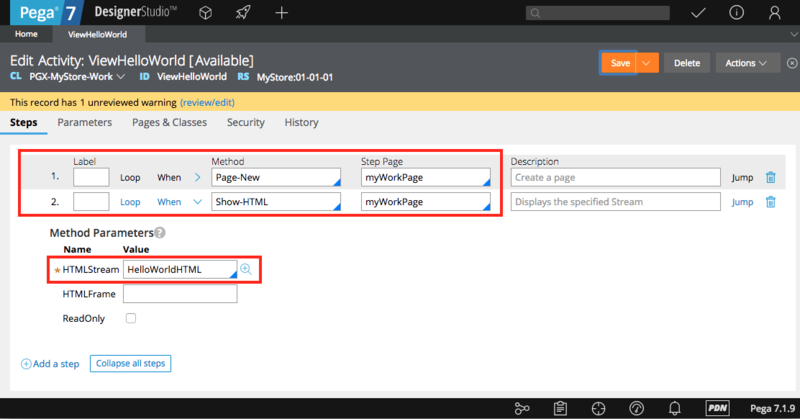 The first step uses Page-New to create a new clipboard page of the class that contains the HTML Rule. 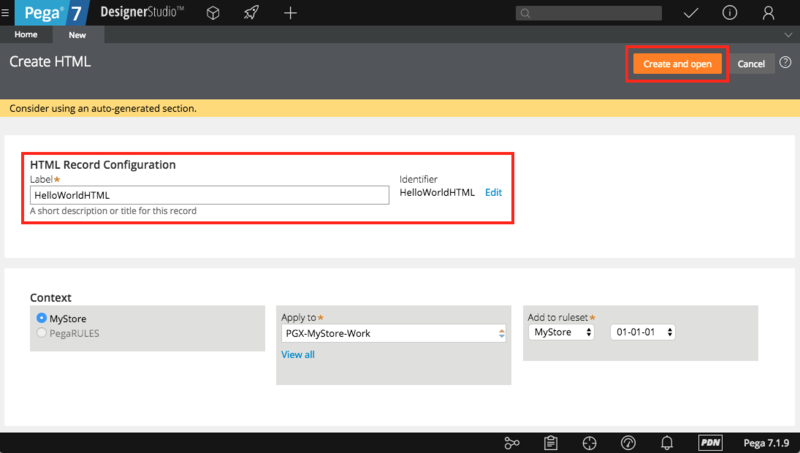 The second step uses Show-HTML and references HelloWorldHTML in the HTMLStream parameter. 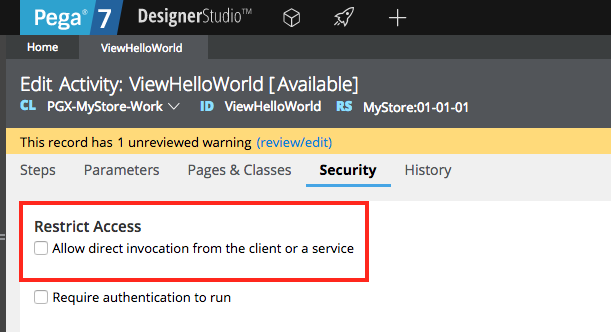 Check the option "Allow direct invocation from the client or a service" on the Security tab of the Activity rule. The option "Require authentication to run" is left unchecked. Leave the Usage dropdown unchanged so that it is set to "Activity". The activity can now be run by clicking on Actions > Run. 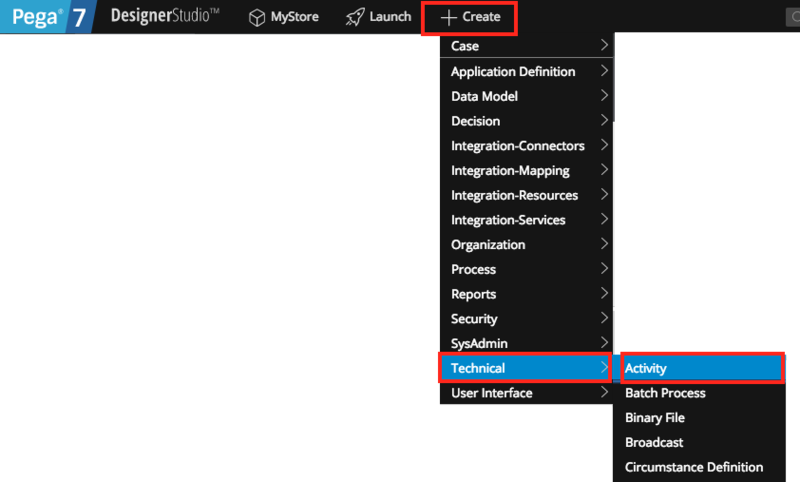 On the pop-up Run Activity window, click on Run to execute the activity. In Google Chrome, right-click on the page and select View Page Source. Here, the HTML code is not modified and retains all white spaces and line breaks. The option "Omit extra spaces?" on the HTML Rule form can be used to remove white spaces and line breaks to reduce the size of the generated HTML code. The HTML code is now reduced to one line and consecutive white spaces are replaced with a single white space. The activity can be accessed from an external browser or other HTTP client via a URL. 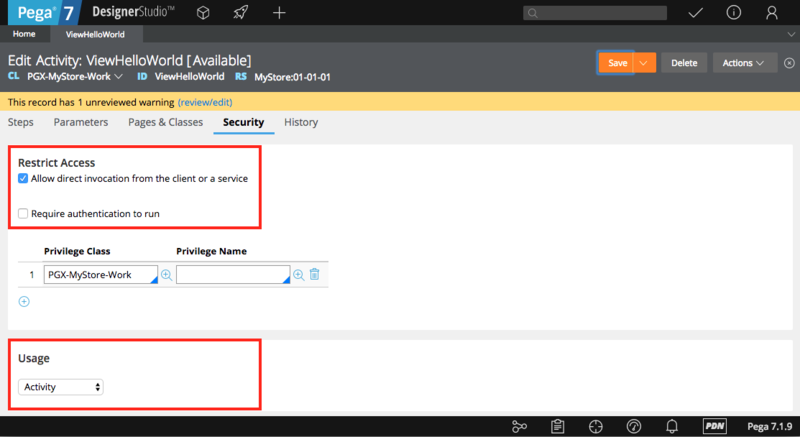 Use valid Pega operator credentials for authentication when calling the activity (…even when the option "Require authentication to run" is NOT checked, authentication to Pega is needed). By default, guest users –unauthenticated requestors– can only access rules in the rulesets provided by the access group PRPC:Unauthenticated.